Like starting training, eating fewer crisps and picking up my guitar again, getting a bike fit is one of those things that I’ve always thought I should do, something that could be very beneficial but for one reason or another I’ve just never quite got around to. I suffer from really bad back pain when cycling, so bad in fact that in the past I’ve been unable to do anything except lie on the floor. After one particularly agonising episode my back was finally tugged back into place by a chiropractor and then I became a courier, in part to build up some strength and fitness to prevent it happening again. Thankfully I’ve not had a crippling episode since – my back just gives me a hell of a lot of gyp if I go on long rides, climb hills or bunnyhop too much, so I have to be careful and I’m always stretching on the bike or going home early. 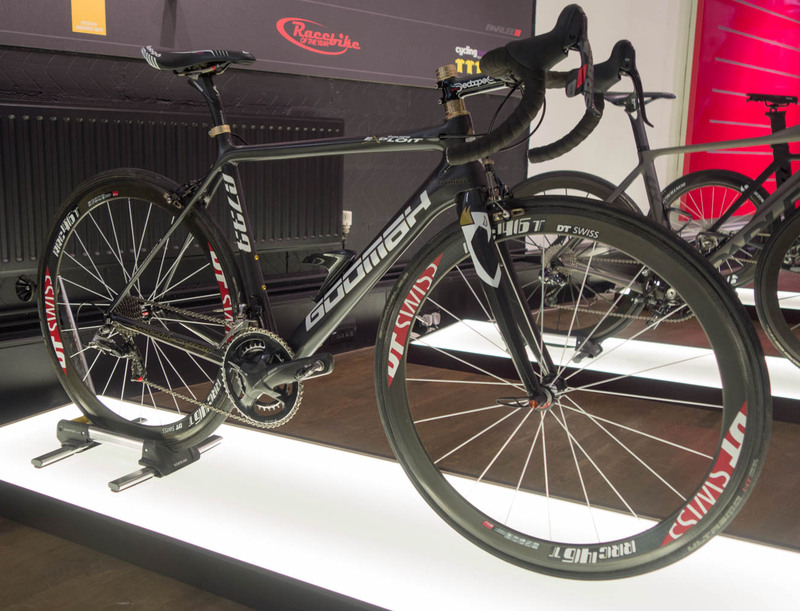 But I’d been chatting to the guys at Bespoke Cycling, and when I received my new Goomah Bike from Assos I finally took the plunge and booked a professional bike fit with them, to see whether an improved position might be helpful. Bespoke is very slick operation with locations in Farringdon, Jermyn St and soon in Canary Wharf. I felt quite the fancy pants turning up with my posh bike then ringing the doorbell for entry, and that kind of set the tone for the rest of the morning. It’s a really nice store. Downstairs, Chris (an ex pro and my personal consultant for the day) and I began talking about what kind of cycling I do, which problems I encounter, and lots of other random things as I was gabbling away and going off on tangents (I live in a tiny village and don’t get out much). Next he had me hop on the bike and begin pedalling whilst he wandered around scrutinizing my bad technique from every angle. The first thing he spotted was the fact I kept locking my arms out, so he told me to pivot forward at the hips and keep my arms bent and relaxed. For the next part of the fit, Chris took all sorts of measurements, from shoulder width and leg length and foot size to the position of my toe joint. It turns out I have one foot bigger than the other, which is not too much of a problem, and that the ball of my foot is quite far forwards. Initial measurements taken, Chris had me hop on the couch and made me sit up and down and move about to align myself correctly. That’s when he spotted it – my left tibia is half a centimetre longer than the other. I actually felt really pleased when he told me that because I’ve been saying I have one leg longer than the other for ages but I just didn’t have any proof. I wiggle my hips something rotten when I pedal and I’ve always put it down to one leg being a different length. I also can’t straighten my right arm and it’s shorter than the left, but that’s another matter. After the couch, I did all manner of bends and one-legged squats so that Chris could see where my imbalances lie. He noticed the fact my left leg is weaker, something I know from trying one-legged pedalling on the turbo and that I rotate to compensate, which I hadn’t realised. For the next part of the fit, I was covered in Velcro dots and had wires stuck on me, then the Retul scanner changed me into a stick person that showed up on a computer screen. By this point, Chris had already put my cleats in the right place with a shim underneath the cleat on my right shoe to compensate for my short leg, and he’d roughly set the saddle height. 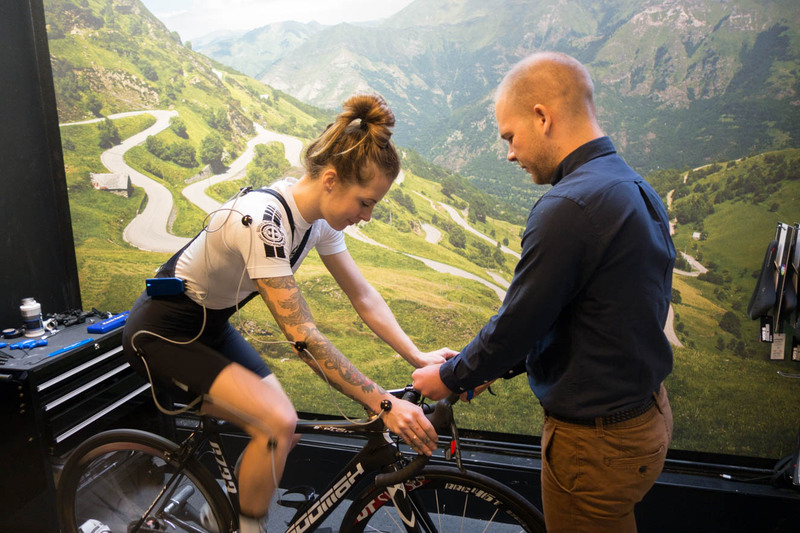 With all the data input into the machine and a visual display of how I was riding, Chris was able to interpret all the information and adjust my position accordingly, and that’s what was so good about the bikefit – Chris himself! 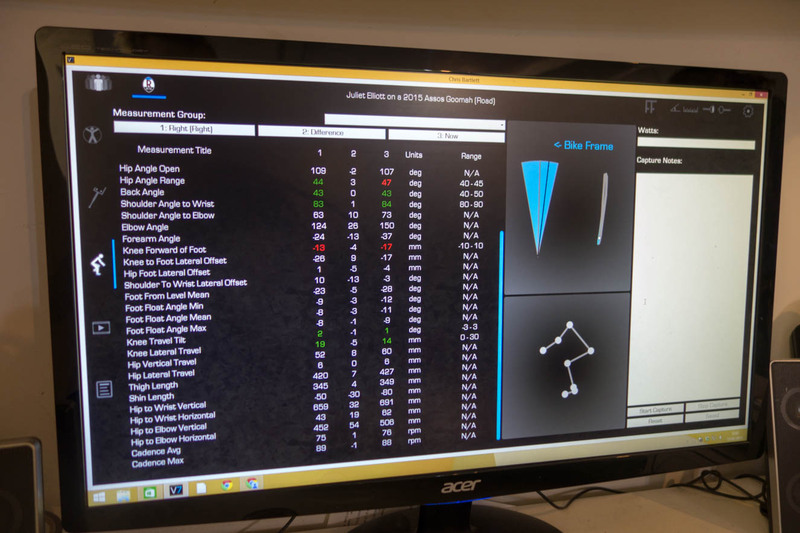 Anyone can buy in a Retul machine, it’s everything else that goes along with it and the human interpretation of all the findings that really counts. It turned out my stem was far too short, I’d had my saddle too high and too far back, my cleats were in the wrong place, I lock my arms out, I have one leg longer than the other and my left leg is weak, so all in all, it was a very eye-opening day. After many adjustments, I left with a new stem, new cleats and shims, a new riding position, a lot of data and some advice and exercises. The data I was sent after the session includes extremely detailed body measurements and guides for the ideal bike set up that I can (hopefully) transfer over to my other bikes. The exercises are designed to counter any inherent weakness or stretch any tight areas that may be pulling my pedalling out of alignment for instance. Now I’ve a longer stem and lower bars, I’m hoping my back will enjoy being less hunched, but it’s still early days so I’m cracking on with the exercises and getting used to my new riding position. The set up of my bike feels really good, and I am already wondering how I rode for so long with everything so wrong, certainly when I get on my other road bike which I’ve not adjusted yet it feels pretty odd. 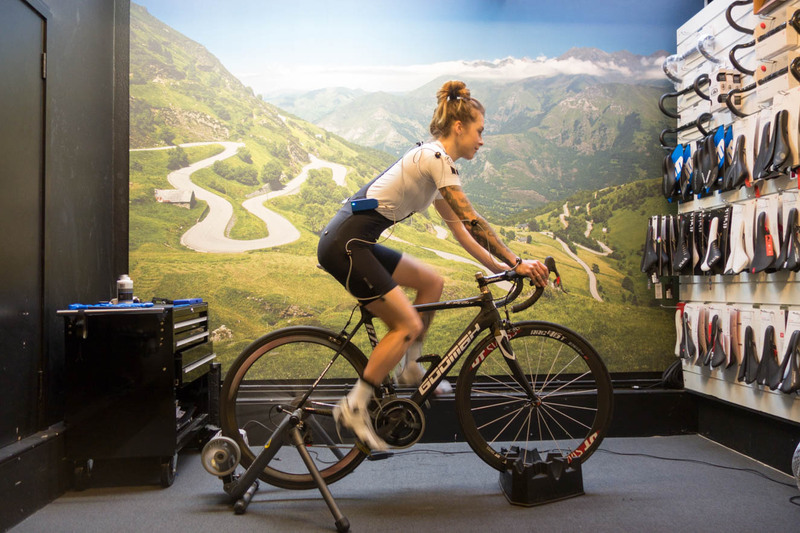 I’ll report back over the next few months about how the new set up goes for me, but as an initial assessment I’d say the fit at Bespoke is definitely worth it in terms of what you get out of it – not just your bike fitting, but plenty of great insights and advice. I have had a bikefit done, nothing as high tech as this one, mine was old skool with a plumb line and tape measure, but I found it amazing. Dropping my bars by a couple of spacers, moving my seat back and up a little, and slightly moving my brakes down the drops made a world of difference to my ride experience. No knee or back pain and no numb hands have meant I can ride longer and harder than before. As cyclists I think we are all slightly masochistic but now my suffering is from riding longer and harder more than aching joints and numb hands and the niggling injuries caused by a poor position on the bike. 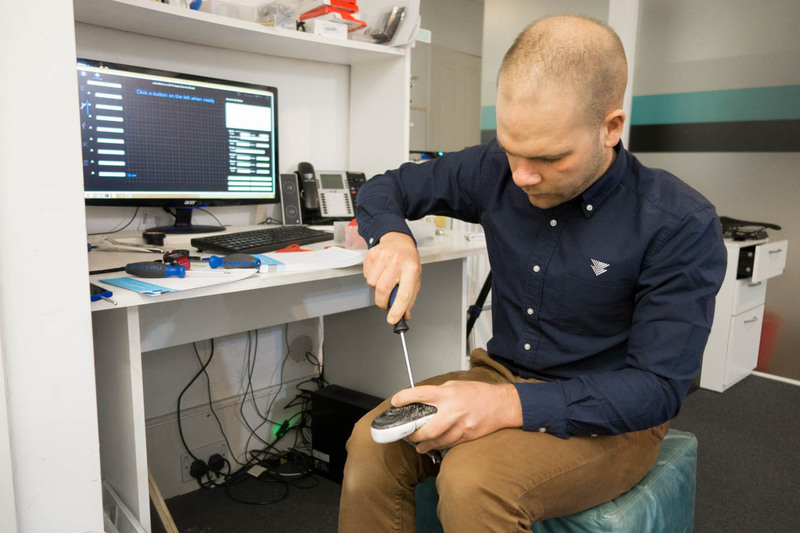 I would recommend to anyone who considers themselves to be a cyclist to get a bikefit done as it will mean they get the most out of their riding and spend less time injured.